Nobody really knows how long Ming Kee has been around. 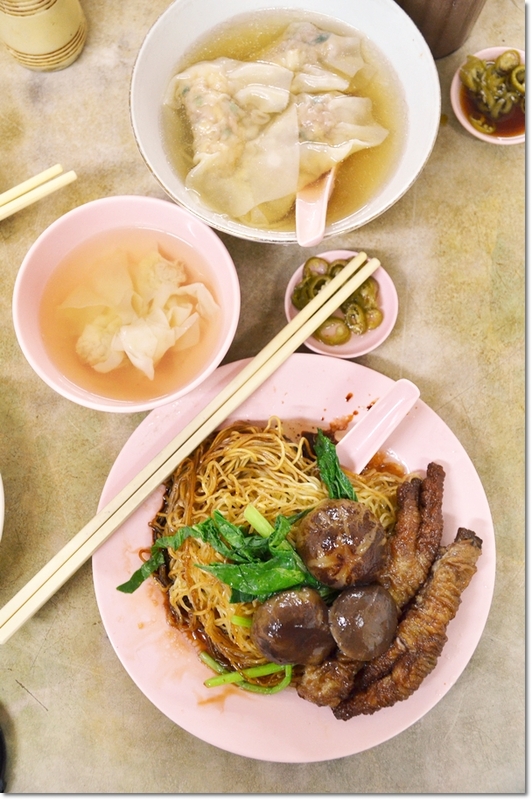 The neighbourhood wanton noodles stall has been one of the most recognized, renowned and revisited eatery within the vicinity of Bukit Maluri in Kepong; tucked in the middle of a row of old shop lots facing the bustling wet market in the mornings. I was brought to this place one fine Saturday morning when we had nothing better to do, really. To be waking up that early and reached the breakfast haunt before 9 am. That’s almost unheard of, especially on weekends when time is better spent on …. well, snoozing. However, we trusted his instinct and constant raves about this really delectable plate of wanton noodles all the way in Kepong that opens very early in the morning and sells out pretty quick too apparently. Traveling to Kepong from Petaling Jaya or Kuala Lumpur on a weekend sounds much better than crawling our way amidst the congestion over the weekdays …. Almost undiscerning and easily passes off as just another kopitiam (what Malaysians call the common coffee shop), Ming Kee occupies a middle lot and houses only one stall. 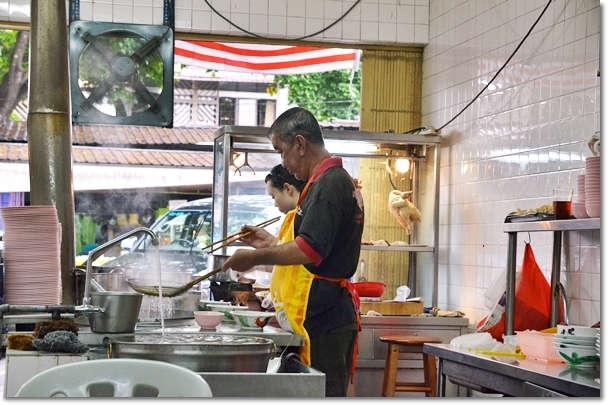 The few people running the stall were seen busy dishing up plate after plate of wanton noodles that morning; albeit the relatively early hours. Some were topped with seductively scrumptious slices of barbecued pork; drizzled with a slightly viscous, dark-hued gravy coating the thin slices of crunchy egg noodles. And what difference the noodles made. You can literally tell when the egg noodles (what we sometimes refer to as wanton noodles, though the word ‘wanton’ means the dumplings) are made in-house or homemade instead of mass-produced or manufactured; with more than a liberal aftertaste of alkaline/lye water. The noodles here at Ming Kee should be their main selling point; whereby the noodles are evidently homemade and retaining that crunch ever more after the seemingly-ridiculous phase of ‘crossing the cold river’. Now, this may sound ludicrous but that last process during the noodles preparation stage involved lightly blanching the noodles in a pail of cold, running water to lend the noodles with a firmer texture; hence what we refer to as QQ or bouncy/springy noodles. When tossed with the myriad of sauces; a mix of soy sauce, dark soy sauce and possibly a dash of lard oil, the noodles came up fragrant, crunchy and ever irresistible. The sauces coating the noodles at Ming Kee were generally milder in flavours compared to similar wanton noodles stalls elsewhere. Even the colour was a shade lighter; a sign of less dark soy sauce being used. Accompanying the noodles here would be a selection of toppings; from the conventional (almost compulsory, really) char siew (or BBQ pork) to slices of poached chicken, braised chicken feet with mushroom to even curry chicken. There are of course the options of having either the usual wanton (minced pork dumplings, served in soup), or the larger sui kow (consisting of minced pork, chopped carrots and water chestnut). We went for both; and everything came out satisfactory. The weak link here somehow was the char siew/barbecued pork slices seated atop the noodles. Don’t get me wrong, the lean slices of pork were passable, just not excellent like some other char siew wanton noodles place in Klang Valley. I for one, prefer my char siew with a sizeable portion of fats, barbecued to a caramelized finish; melt-in-mouth, smoky goodness. You know those dark/charred version with sweet/sticky sauce right? Another point to note is the flavoursome soup; evidently boiled with addition of powdered flounder fish, and a light dash of pepper. Very tasty, but thankfully not another MSG-laden, thirst-inducing elixir. 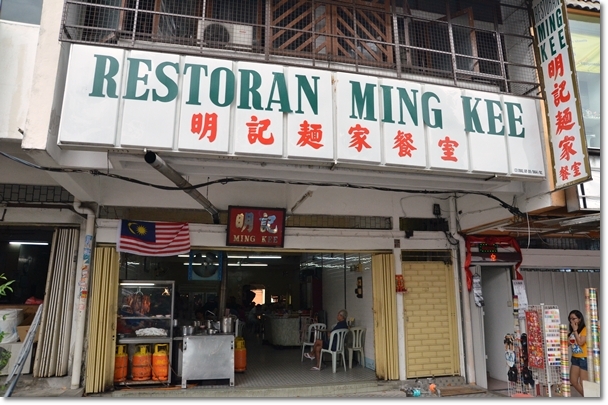 I guess establishments like Ming Kee deserve a try, even if this is situated in Kepong and a considerable distance away from the comfort of your home. After all, the decades spent perfecting their recipe has to be acknowledged somehow, no?